CORATEX and CORATEX HT are purging emulsions for plastics processing equipment used in many markets, such as the packaging industry, film manufacturers, or the toy industry. CORATEX is generally addressed to the operators of injection moulding machines with single tools and hot runners, extrusion plants, blow moulding, and film blowing lines. Saint-Gobain has been successfully distributing CORATEX for more than 30 years, and recently the additonal product line CORATEX HT has been developed. The HT version has a pleasant orange odour, and is moreover a very popular for manual cleaning of single machine components after strip down. 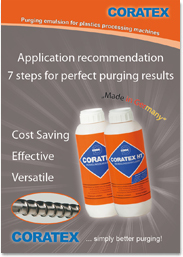 Convince yourself of the Benefits of purging with CORATEX. You will be enthusiastic about how much time, material, energy, and process cost you will manage to save. Interested? Contact our customer service team today.